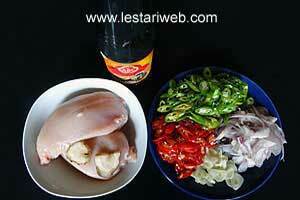 Are you feed up with just daily chicken dishes?? 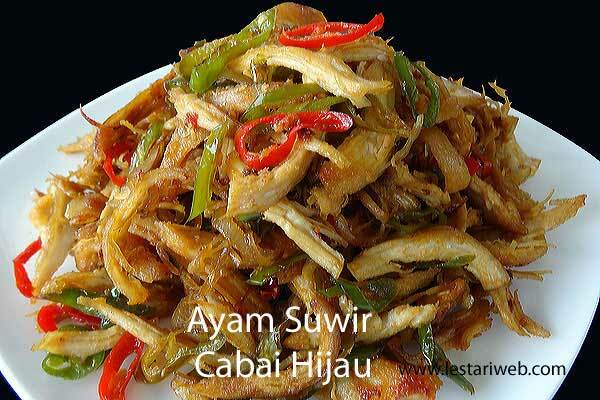 If yes, try this special spicy dish from East Kalimantan : Ayam Suwir Cabe Hijau or Torn Chicken with Green Chili. Here the fried chicken fillet will be torn apart in pieces, enable the spicy chili relish to mix perfectly with the chicken. As a result ....hmmmm spicy & yummy !! 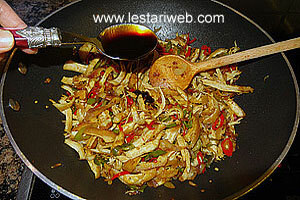 This is actually stir-fry based recipe & the secret of delicious asian stir-fried dishes is more spice is better then too little. 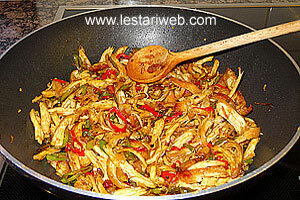 The spice should be well fried before the main ingredient (here is chicken) to be added-on. With this tipp, you'll obtain the best taste. ATTENTION : HOT & SPICY !!!! Only for Chili fans. Prepare all the sliced ingredients. Put aside. Bring 1 liter water to boil then add the chicken breast fillet ***. Cook the chicken fillet over medium heat until tender ( takes about 15 minutes). Set aside to drain. 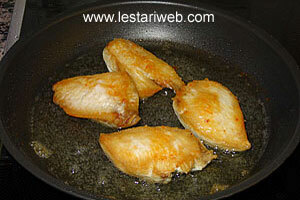 Heat about 50 ml oil in a frying pan, fry the chicken fillet until golden brown. Tear the chicken fillet into a long strips form. (Hold the chicken with meat-fork & tear it with knife or you can use your finger when the chicken is cold enough to handle). 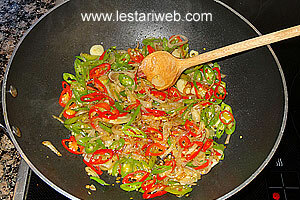 Heat 5 tbsp oil in a frying pan & stir fry shallot & garlic until transparent & fragant. Add the chillies & galangale. Stir all the time until wilted. (Add salt immediately if the chili's fumes causes you to cough uncontrollably ;-). 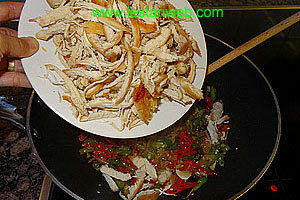 Add the torn chicken and stir to mix. 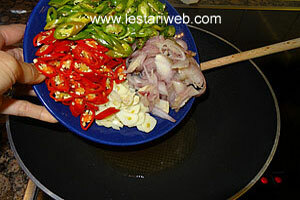 Add kecap manis and stir again to mix. Adjust the seasoning, add salt & sugar to taste. 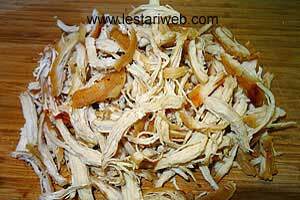 *** Add the chicken fillet into boiled water then cook on the medium heat to preserve it's best taste.